To setup a supplier who does not have an existing UCB Supplier Profile (active or inactive). Click on image to open with links to supporting documents. To update 1 or more fields on an existing Supplier Profile (active or inactive). Click on image to open with links to supporting documents. To use an existing Supplier Profile that is currently inactive and not available for shopping. Click on image to open with links to supporting documents. How can I submit the UCB Sub W9 form? Because forms can contain sensitive information like Social Security Numbers, the UCB Sub W9 form must be submitted to our secure fax line (510-664-7209). You can use a fax machine or an online fax service to submit. The University email system does not support transmission of this data. There are several ways to submit online, you should use the process that best fits your business needs. We do not endorse any specific method but can suggest reviewing offerings available online. You can search for "online free fax" or review this website: How-To-Geek website for more information. How can I find out which form fields are required? Depending on the type request and supplier, not all form fields will need to be completed for processing. 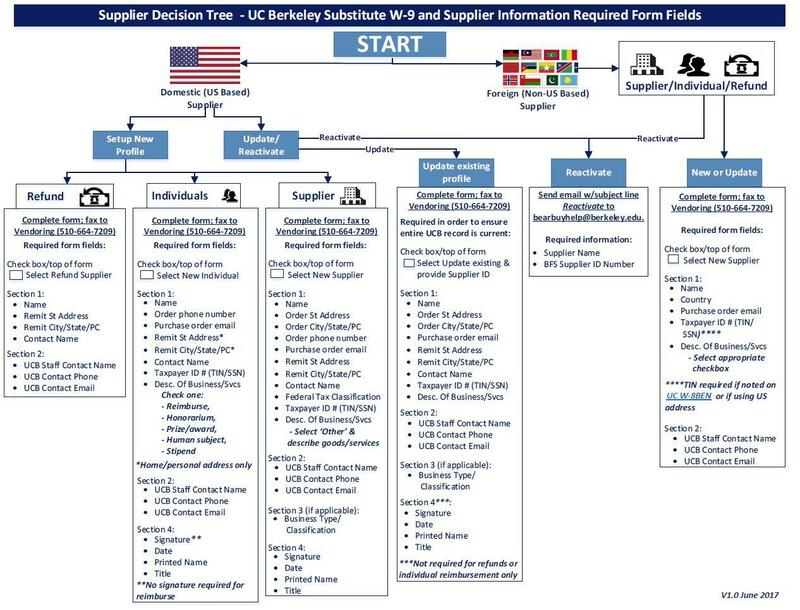 Below is a quick decision tree to help you identify which fields are required based on your Supplier request. Draw your signature in Microsoft Paint, save it as a jpeg and insert it into the signature area on the document. Visit the How-To-Geek website to learn more about creating an electronic signature.